To establish a proper exercise routine, you need to follow a few basic guidelines. Before you start an exercise program or routine, a thorough medical history and evaluation are recommended so you and your doctor can identify limitations on certain exercise movements. It is highly recommended that you receive proper instructions for performing these exercises before beginning your exercise routine or program. Anaerobic exercise is not recommended for some people with certain heart or orthopedic conditions. Discuss this with your doctor. Aerobic exercise: any activity involving large muscles, done for an extended period of time. Aerobic exercise is done primarily for cardiovascular fitness and weight loss. Anaerobic exercise: any activity that does not require oxygen for completion of movement. Usually refers to resistance training. Anaerobic exercise is done primarily for increased muscle mass and toning. Warm-up - 3 to 5 minutes of exercise at a lower intensity (for example: speed or grad for treadmill) to warm up your muscles and slowly increase your heart rate. Conditioning - aerobic exercise conducted for a specific duration (e.g. 30-45 minutes) in which the target heart rate is achieved and maintained. Cool-down - 3 to 5 minutes of exercise at a lower intensity to bring down your heart rate and lessen risk of injury. Mode — The type of activity you choose to do. Activities should include those that work the large muscles, such as walking, jogging, swimming, aerobic dance, or cycling. There are many types of exercise you can do. Find an activity you enjoy and will tolerate long term. Recommended: any activity that you enjoy. Intensity — How hard you work for the duration of the activity. Recommended target heart rate: 60 to 80 percent of your predicted maximum heart rate. (Predicted maximum heart rate = 220 minus your age). For example: a 45-year old person’s maximum heart rate would be 220-45 or 175; the target heart rate range (60%-80% of maximum heart rate) would be from 105-140 beats per minute. Another way to determine the intensity of your activity is the Rated Perceived Exertion Scale (RPE). Those with heart disease should discuss exercise with their physician. Some heart conditions may require a modified or supervised exercise program. Medications may have an effect on heart rate; therefore if you are taking any cardiac or blood pressure medications, ask your doctor if they have any impact on your target heart rate. Duration – Length of time of the activity. Recommended: 30 to 60 minutes, depending on your goals. Frequency – The number of days per week that you exercise. Recommended: 3 to 7 days per week, depending on your goals. 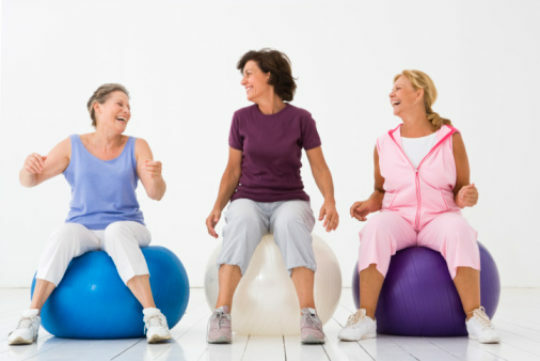 The American Heart Association (AHA) guidelines call for a minimum of 30 minutes of aerobic physical activity performed at moderate intensity (60 to 80 percent maximum heart rate), either in one continuous period or in intervals of at least 20-minutes duration on most -- preferably all -- days of the week. This is the amount called for to reduce the risk of coronary disease. It is equivalent to briskly walking at least 1.5 miles per day or raking leaves for half an hour. For weight control, you may need to increase the amount of time you exercise to burn more calories. Anaerobic exercise involves using free weights or machines to build muscle mass and tone. Mode – The activity that you choose to work a particular muscle group. Intensity – The amount of weight you lift during a set. Repetition – A complete movement of a particular exercise. Sets – A group of repetitions. For toning, 12 to 20 repetitions with lighter weights are usually recommended. In contrast, fewer repetitions (such as 8 to 12) with heavier weights are performed to build muscle mass. Recovery – The amount of time you rest in between sets. The recovery ranges from 0 to 180 seconds. Frequency – The number of days per week that you perform strengthening exercises. Strengthening exercises should be performed with a day or two of rest in between workouts. When setting goals, it is important to design a program that you can do in a schedule that you will definitely keep. Look at your calendar and schedule in your exercise sessions. You do not have to do all three components of the exercise program every day, but to lose weight the most important component will be aerobic conditioning. If you need to start by exercising in 10-minute increments, that's OK. Every week or so, your goal will be to increase the amount of time you exercise until you are exercising at least 30 minutes per session. What is a body composition test? A body composition test is a way to determine your current percentage of body fat. It is also a way to track progress during your exercise program. A body composition test is more accurate in determining your ideal body weight. The ideal range for females is 18 to 26 percent body fat. The ideal range for males is 12 to 17 percent body fat. Along with regular exercise, weight loss requires a dedicated effort to change your eating habits. Weight loss may require many strategies and support from a team of nutritionists or registered dietitians, exercise specialists, and peers. Ask your doctor to speak to a dietitian or exercise specialist if you need any assistance in planning your program. At The Cleveland Clinic Foundation, call the Preventive Cardiology and Rehabilitation Program at 216.444.9353 or 800.223.2273 ext. 49353. They can assist you in a monitored exercise program or exercise prescription.